In Samburg, you can book a fishing or hunting trip with one of the many guide services in town and there are plenty of room available for an overnight stay. The best spot to catch a view of the sun setting is from one of the benches in Spicer Park. When you do come visit Samburg, bring your camera. With all the wildlife, the sunsets and natural beauty of Reelfoot Lake you’re sure to come away with a few good images. In addition to the wintering Bald Eagles, other birds that call the lake home include owls, egrets, ospreys, white pelicans and herons. So pack a suitcase, round up the kids and steer your car in the direction of Samburg and discover all this small town has to offer. Built in the summer of 2008, Spicer Park is located directly across the street from Southshore Resort and is open to the public. The park is complete with benches to simply relax on or view a Reelfoot Lake sunset . The park features two picnic tables and three piers for fishing and is a one-of-a-kind park that you must make a point to visit. Reelfoot Lake is known for its eagles. White Pelicans also make the park home during their annual fall migration. A variety of other birds can be seen from the visitor center, including Prothonotary Warblers, Double-crested Cormorants, Wood Ducks and various wading birds. To the west, Keystone Trail offers similar viewing, with abundant Goldfinches and migratory warblers attracted to thick, second-growth woods. From the shore, American Coots and White Pelicans can be seen in large numbers in this section of the lake. One of the best ways to experience Reelfoot Lake is by boat. The lake is a flooded forest and is shallow with lots of submerged stumps and standing trees. Boaters have to navigate slowly and cautiously. There are few large boats on the lake which makes it a nice place for canoes, kayaks and jon boats when the winds are calm. Boats may be rented from local private businesses. The park has five public boat launch ramps to accommodate fishing boats and small pontoon boats. The park offers a variety of canoe and pontoon boat tours throughout the year. This is a short, gravel trail that takes you through native warm season grasses and ends at one of our refuge ponds. The trail has 3 interpretive signs that discusses warm season grasses and its benefits, wildlife that use warm season grasses, and pond life. The trail offers benches for sitting and enjoying the sights and sounds of the outdoors. This half gravel, half boardwalk trail winds through our bottomland harwood forest. 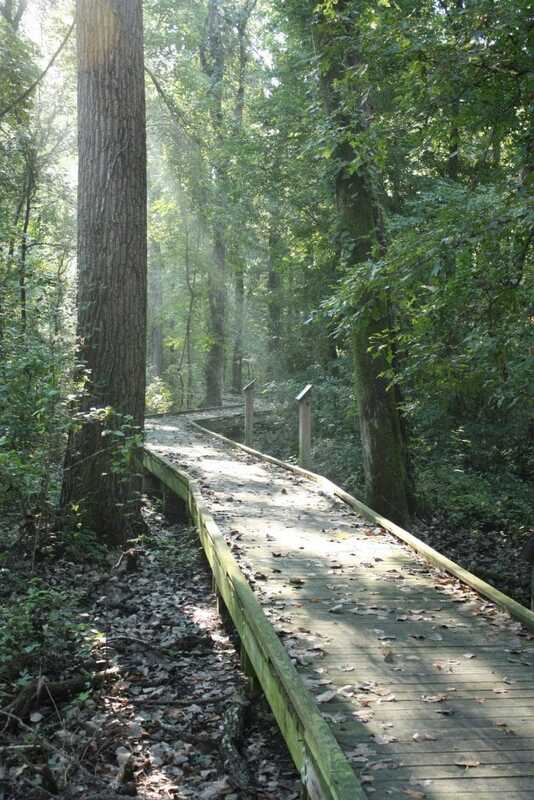 Numerous interpretive signs line the trail to inform you about animals and plants found in the area, flucuating water levels, bald cypress trees, and much more. Benches can be found along the trail which allows you to sit and listen to the surrounding songbirds. During spring, you can hear ducks flying up around you in nearby pockets of water. The trail is .58 miles, but if you walk the full loop, it is approx. 1 mile.